The Triple Bunk Bed - By The Superhandyman! *UPDATE: Below is a built-in model which adds a nice custom feel to any room. I also have a very tasteful free standing model (not pictured here yet) that can be moved if needed. We have limited space in our home. I’m not complaining. I don’t want a big house. It’s too much maintenance and furniture for my taste or lifestyle. My family, and the fixer-upper we live in, keeps me busy enough–which leads to my point. It’s a challenge many families are faced with as more people are downsizing. In any event, that’s when I came up with the Triple Bunk Bed (aka Triple-Decker Bunk Bed) for our three boys. I’ll be honest, my wife had her reservations. She wondered if each boy would have enough room to sit up or if it could be structurally sound (and safe). “You do realize you’re married to THE Superhandyman don’t you?” I responded. She agreed to give it a chance. 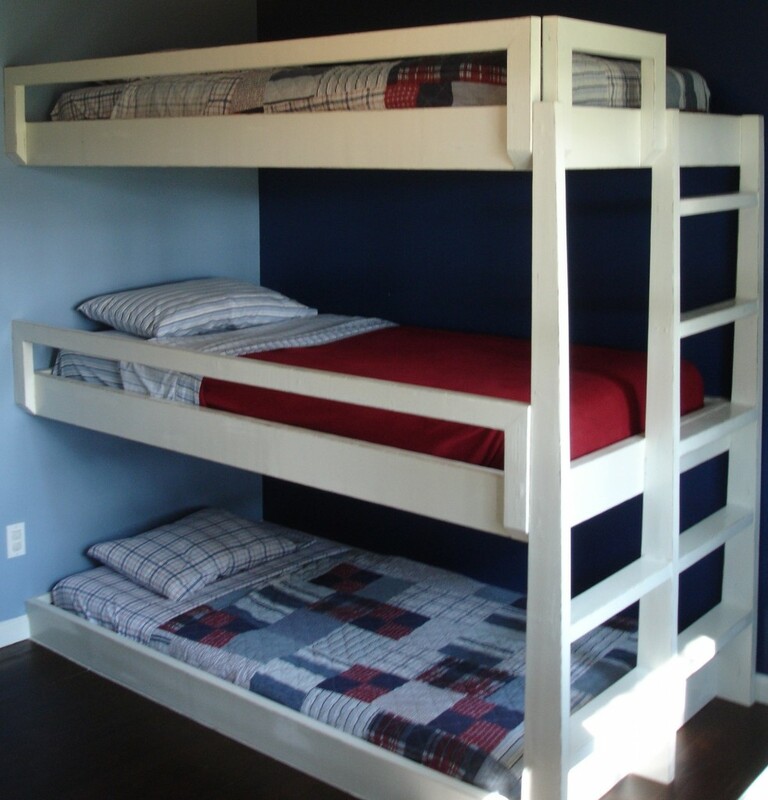 The Triple Bunk Bed needed to be open and functional, safe and sound, and fit within the space of our 8 foot ceilings. It took some designing, but I figured it all out. As you can see in the picture, the ladder for the second and third bed offer both support and access to their respective areas. There is no clumsy ladder to move around or out of the way. It all works together to create a sleek and inviting design that even gives each child equal space to sit up in. In addition, since taking this picture I added a small IKEA light in each sleeping area for reading time. The boys love laying in bed and reading Star Wars books before ‘lights out’. I would LOVE to build these for you. The beds can come in any color or in many custom finishes. Simply email here and we will work out all the details. I am willing to travel to wherever you are to make this one-of-a-kind masterpiece. Whatever the case, the Triple Bunk Bed is just one solution that may work for you. It has exceeded our expectations. Let it exceed yours. Plus, the kids love it! *Please be sure to see my other designs: Decorative Barn Door, Old Barn Wood Table, Barn Wood Wall, Breakfast Nook Booth, Basement Bunk Bed, and Custom Loft Bed.